One of the true joys of a campervan adventure in France at this time of the year is being able to gorge on fresh, healthy produce wherever you go. 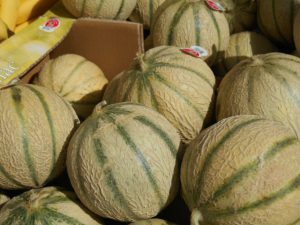 We reveal which are the four best and closest fresh fruit, vegetable and produce markets to our depot, and so a great starting point for your adventure in France. 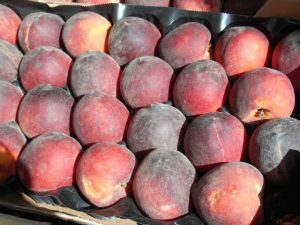 We did not have the best of weather this spring and the fruit was a little late to ripen by French standards, but the weather is gorgeous now and there is suddenly ripe fruit, at bargain prices, everywhere! 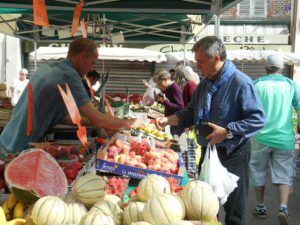 Joigny, less than 30 minutes’ drive from our depot, has a great produce market every Wednesday and Saturday. Sens, just 15 minutes away, also has an excellent produce market (just opposite the cathedral in a stunning, recently restored, traditional market hall), which is open on Monday, Wednesday, Friday and Saturday mornings. 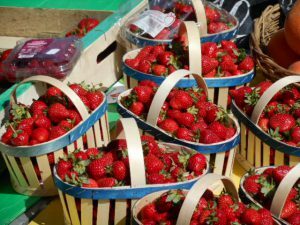 Here are some photos of fresh fruit and produce from Joigny market taken last Saturday. 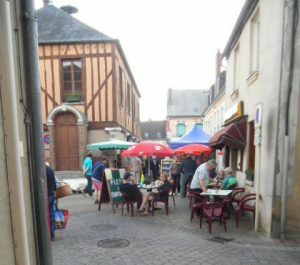 If you pick up your campervan on a Saturday and would like to visit a local market on Sunday morning there are good Sunday markets at Charny (40 minutes from us) and Chablis (an hour’s drive from us). Both are very pretty Burgundy towns with good restaurants and shops, so a good place to spend a first night too. Strawberries and raspberries that taste like they already have cream and sugar on, new potatoes that taste like they already have butter on…that’s our kind of food! The markets also sell everything from roasted chickens to artisan cheeses so you can make a hassle-free meal in your campervan kitchen from a quick visit to a market. Ripe Charentais melon with cured Bayonne ham, buffalo Mozzarella with perfect vine tomatoes, runny Brie de Courtenay (a local variety) with a traditional French baguette and celery, artisan smoked salmon or trout with crisp Batavia lettuce and a squeeze of lemon – we could go on and on. France stays true to the seasons and imports very little produce, so the selection will change with each month but remain amazing until the winter (even then you can be assured of crisp apples, juicy citrus fruit and freshly pulled up root vegetables). 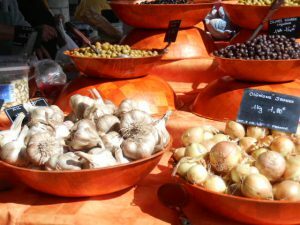 Come and discover why France is the gourmet capital of the world from the comfort of a motorhome or campervan! ← Is gluten-free in France possible?